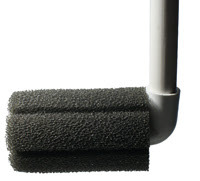 Another use for larger reticulated sponge filters such as the Hydro Pond #4 is as a primary sump filter. The large double reticulated high volume water flow sponges provide for copious amount of surface area for bio filtration. This high flow design of the reticulated Hydro Pond Sponges provides more surface area and much less channeling of water than bio balls can in the same amount of space (water channeling is the major problem of bio balls, sand, ceramic media and even bio stars, which results in areas of little or no water contact). 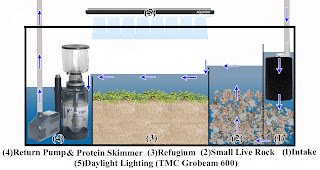 * An AAP/TMC GroBeam or Marine White Premium High efficiency/high output LED light is also employed for refugium. The Hydro Pond 4 can easily handle an aquarium up to 250 gallons or central aquarium system of similar gallons. The amount of water volume can increase with multiple filters or the addition of Sponges for the use of diffusion of water into the sump. 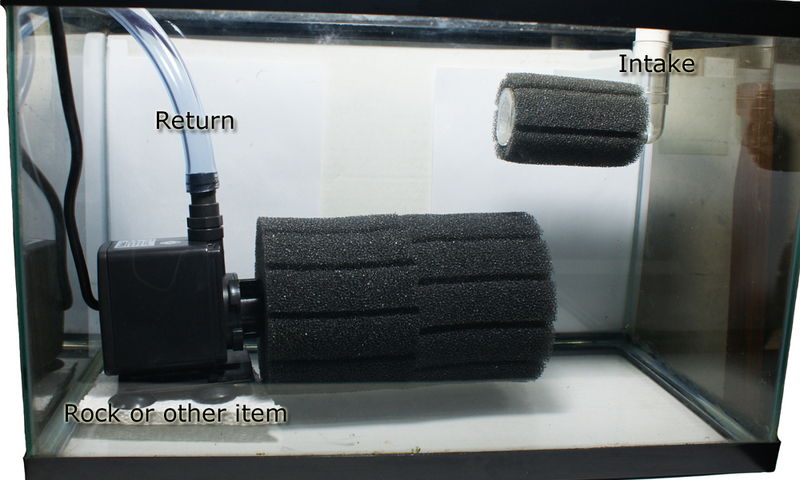 A Hydro Pond 4 can be used for the water diffusion or the smaller more simple Filter Max #3 can be employed for this use as well (some square sponges such as those for the larger Aqua Clear Filter can be used in a diffusion chamber as one more alternative). Probably the simple way to build this sump is to use a Filter Max #3 or Hydro Pond 4 attached to PVC pipe that pours (diffuses) water into the sump. These diffusion sponges will act as a wet dry filter. Step two would be to add a Hydro Pond 4 to the pick up pump such as the Via Aqua 2600 in the top picture to return the water to the aquarium (a Rio 20 HF Pump would work even better). With two Hydro Pond 4 Filters (one for pick up & one for diffusion) your capacity would be up to 500 gallons. With one Hydro Pond 4 Filter and one Filter Max 3 or large Square Aqua Clear 110 Sponge your combined sump capacity would be about 300-350 gallons. Finally, for readers scratching their heads wondering why they have not read or heard of this type of simple aquarium sump set up, the answer is simple; Many aquarium professionals have employed this method for years, however since the cost is very low (the purchase of a pump, 10 gallon aquarium, and a few Sponge Filters/sponges), most aquarium supply sellers would rather sell you their elaborate sumps of similar size and then charge over $350 (often without the pump too) for a set up that is likely of lower actual bio capacity than the above sump suggestion that would cost the DIY builder well under $125 (including the pump and a 10 gallon aquarium that can be cheaply purchased at Walmart, PetCo or better your local specialty aquarium store). With the addition of a good UV Sterilizer placed in-line for your Return such as the Terminator 36 watt Category B UV or AAP Vecton 25 Watt Category A UV, you will have a sump or central aquarium system that is second to none (make sure to change your UV Bulbs in your Sterilizer every six months for optimum performance)! Aquarium LED Warranties/Reviews, Including SB Reef Lights, Finnex, etc.